US-headquartered Pluto.TV aims to tap into the growing cord-cutter market. The streaming video startup, which fashions itself as a Spotify for premium video, first launched in 2014. It monetizes via advertisements and is completely free to stream for users in the United States. Earlier this year it was estimated to have over 6 million monthly active users. Pluto.TV doesn’t have an embedded video player built-in to the site like Netflix or Hulu. When you sign up, you’ll be prompted to download another piece of software. Once that’s installed you’re able to stream all its free content if your IP address is from the US. Users looking to circumvent this restriction should look to sign up for a VPN and spoof their location to the US by changing IP address. That’ll unlock the entire roster of content on Pluto.TV. Short for Virtual Private Network, a VPN encrypts all the traffic flowing to and from your device and tunnels it via an intermediary server. By choosing a location in the US, host websites will automatically assume you’re physically present there. A VPN also makes it very difficult for ISPs, hackers, and surveillance agencies to monitor your internet behavior. What’s the best VPN for Pluto.TV? ExpressVPN is at the top of our list because of the simplicity of the product and the robust service it delivers. It works smoothly and efficiently with minimal downtime. There’s an encompassing network in place with over 3,000 servers spread across 94 countries. The United States hosts servers in 20 locations. ExpressVPN does not store any traffic logs, so that’s a positive. There’s a bit of metadata retention, specifically the date (not time) of connection, choice of server location, and total bandwidth used. It’s used to improve the quality of service. ExpressVPN utilizes 256-bit AES-CBC as its default encryption protocol as well as both HMAC authentication and perfect forward secrecy. There’s an internet kill switch included, which the company refers to as a ‘network lock’. This feature adds an additional layer of security by temporarily halting all web traffic if the connection drops. Apps for both Android and iOS are included as well as desktop software for Windows and MacOS. One subscription allows for three simultaneous connections. BEST VPN FOR PLUTO.TV:ExpressVPN is our #1 Choice. A super fast and reliable choice which unblocks Pluto.TV abroad, along with most other major streaming services. Best-in-class security and privacy, keep no browser logs, kill switch and leak protection. Hard to beat. Try it risk-free with the 30-day money back guarantee. NordVPN allows you to pick a server based on its location or by use case – streaming TV, ultra-secure privacy, anti-DDoS, or anonymity. It’s been around for over a decade and this experience has helped it inculcate a loyal community of fans. That’s not surprising because it checks all the boxes when it comes to a well-engineered VPN. Like IPVanish, NordVPN won’t record your data. Both of them are examples of completely logless services. The company operates 5,113 servers in 59 countries – over 1,700 of these are located in the United States. As for encryption standards, it uses the 256-bit AES protocol by default coupled with 2,048-bit SSL keys. DNS leak protection is enabled. Apps are available for both Android and iOS as well as for Windows and MacOS. A single account allows for six devices to connect at any given time. BEST BUDGET VPN:NordVPN is a good value choice. A great value option which works reliably with Pluto.TV and most popular streaming sites. Connects up to 6 devices simultaneously. 30-day money back guarantee. CyberGhost is a reliable VPN provider that delivers significant value for money. It’s also rapidly building up its server network to compete with some of the heavyweights on this list. The company doesn’t log user behavior and browsing habits. It’s also headquartered in Romania, beyond the jurisdiction of western government agencies and not subject to mandatory data retention laws. Currently, there’s a little over 3,700 servers in 59 countries. The United States houses 733 servers. Apps are available for both Android and iOS as well as desktop software for Windows and MacOS. It doesn’t unblock Amazon Prime but does work seamlessly with Netflix and BBC iPlayer. A maximum of five devices can connect with one subscription. Its choice of encryption standards is pretty good. CyberGhost Pro deploys 256-bit AES encryption on the OpenVPN protocol by default along with 2,048-bit RSA keys and SHA256 authentication. An internet kill switch is included. GREAT VALUE:CyberGhost is easy to use. A well priced solid performer. Good at unblocking Pluto.TV but may struggle with some other popular streaming sites. Comes with a 45-day money back guarantee. IPVanish is considered to be another behemoth in the VPN business. It combines rugged speeds with hardy encryption protocols. A positive indicator is that there’s no internal data storage of any nature. In our user review, IPVanish streamed 1080p video without any hiccups. Its servers are optimized for speed and stability so it’s unlikely that you’ll face many issues while trying to access Pluto.TV. Global server presence is an impressive 1,300 in total spread across 75 locations around the globe with the US making up the biggest chunk. IPVanish doesn’t work with Netflix or Hulu but it does unblock BBC iPlayer, HBO Now, Amazon Prime Video, and Sling TV. One account allows for five simultaneous connections. Encryption standards are top-tier. It uses 256-bit encryption on the OpenVPN protocol by default, SHA512 authentication, and a DHE-RSA 2,048-bit key exchange with perfect forward secrecy. You’ll find apps for both iOS and Android as well as desktop software for Windows and MacOS. VyprVPN secures connections via the OpenVPN protocol, 256-bit AES encryption, 2,048-bit RSA keys without perfect forward secrecy, and SHA256 authentication. An internet kill switch is included by default. It does, however, emphasize that said data is used to improve the product and that the content of communications is never scrutinized. Users can opt to access the proprietary Chameleon™ protocol for an additional fee. This further obfuscates your connection making it even more secure. The service offers over 700 servers spread across the globe with eight locations in the US. Apps are available for both Android and iOS as well as desktop support for Windows and MacOS. A paid account allows for five simultaneous connections.UNLIMITED DATA USAGE:VyprVPN is user friendly. Good speeds and uptime as all servers are owned by VyprVPN. Great privacy and security. 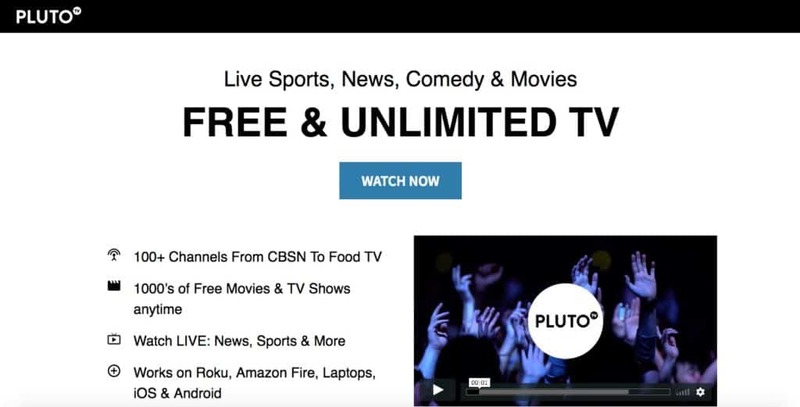 Unblocks Pluto.TV but not the cheapest option here. 30-day money-back guarantee. Zenmate first became popular for its free Chrome VPN extension. The company also has paid plans which offer a significantly better product. This includes a larger network of servers and stringent encryption protocols. Premium packages unlock over 1,000 servers spread across 29 countries. A bunch of them are located in the US but the company doesn’t say how many, exactly. The service uses 128-bit AES encryption in conjunction with 2,048-bit RSA keys and SHA 256 for authentication. An internet kill switch is included. These are adequate protocols. One troubling aspect is that the service did display some DNS leaks during our extensive testing. Automatic DNS leak protection isn’t included. Apps are available for both Android and iOS. Some casual browsing on the interwebs will expose you to a bunch of free VPNs. Such options incorporate a frictionless signup process and usually don’t require you to fork over credit card details. Users think they’re getting an awesome deal; no fees, no fuss. But there’s no such thing as a free lunch. Free VPNs deploy weak encryption standards, display pitiful speeds, and run a real threat of privacy invasion. These providers aren’t interested in putting out a premium product. They want a critical mass of users to make it easy to monetize by bombarding them with invasive advertisements and mining individual data. It’s in your best interests to refrain from using them. If you’re currently low on cash, check out our recommended list of the best VPNs with a free trial. If you’re trying to access Pluto.TV from a location outside of the US, then you want the reassurance that your location will remain hidden. After all, that’s probably one of the reasons you signed up for the service in the first place. Our list of recommended VPNs have kept user interests at heart and don’t have any prior history of divulging personal details. Unfortunately, not all providers are born equal. Here are three examples of VPN providers that have an uneasy history of throwing their users under the bus. We believe you should stay away from them if possible. Israel-based Hola operates a peer-to-peer VPN extension for Chrome that once had a pretty large user base of almost 50 million. But it chose to deploy these machines as part of a colossal botnet army, using the scale and critical mass to engage in things like Distributed Denial-of-Service (DDoS) attacks on other sites. Free VPN provider Hotspot Shield was accused in July of forcefully inserting tracking cookies in order to mine user data and sell it to advertisers. Another egregious act allegedly committed by the company was to deliberately divert legitimate HTTP requests to affiliate sites. This was specifically targeted at users typing in e-commerce requests, e.g. with the intent to purchase shoes from Nike. Instead of navigating users to the original site, Hotspot Shield deflected the request to a partner site where it would earn affiliate commissions if a sale went through. PureVPN collaborated with the FBI to identify a suspect in a case of online blackmail. The company had a ‘no-logs’ policy at the time, but it was still able to sift through its data to pinpoint the individual. This means it has and still does log users’ real IP addresses, despite not claiming to. What comes after signing up for a VPN? Once you’ve browsed through our list of recommended VPNs and settled on a provider, the immediate steps are to log in and pay for a subscription. Try to hone in on a provider with a large number of server locations in the US. The only way to securely access Pluto.TV is via a server there. Pluto TV also works on Roku, Amazon Fire, Xbox, Playstation, and Android TV. If you’re looking to stream Pluto.TV on any of these devices then it’s important to understand that they don’t come with in-built support for VPN apps. But all is not lost. You can leverage the VPN on a virtual router, which is a similar process to how smartphones set up mobile wifi hotspots.